The Metrodata FC3X00 product family provides a high performance solution for extending and interconnecting E3 and DS3 communication infrastructures using fibre optic cabling. With the need to extend, or interconnect, communication infrastructures over greater distances, and the cost of fibre falling dramatically, the Metrodata FC3X00 fibre Converter product range provides a cost effective solution for the extension of E3 (34Mbps) and DS3 (45Mbps) services. Using fibre optics the FC3X00 products extend the operating distance for E3 34Mbps G.703 and DS3 45Mbps G.703 interfaces whether on a router, video system or similar equipment over multimode or singlemode fibre. The FC3X00 products are totally transparent to both payload and protocol and as such will support unframed or framed data. 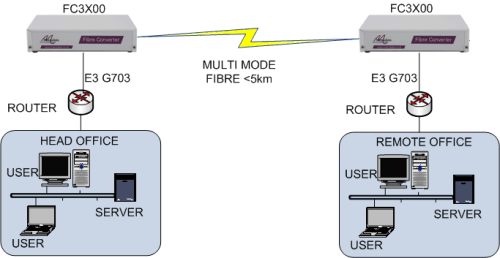 The maximum operating distance of the FC3X00 is 5km over multimode fibre, or 70km over singlemode fibre, although specific installations may only operate over lower distances due to the variations in losses of different types of fibre cable, the use of connecting fibre cables, or patch panels. When operating over 50% of the maximum distances it is advisable to calculate all fibre optic connector and cable losses and compare these with the fibre optic loss budget specified for this product. The standard FC3X00 is supplied with SC fibre connectors and operates at a nominal wavelength of 1300nm. Other wavelengths are available on request, e.g. 850nm, 1550nm, 1550/1300 WDM. Other connector options are also available on request, e.g. ST, FC. 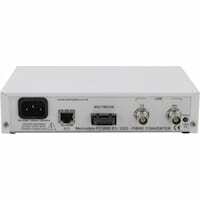 The FC3X00 G.703 connection has twin BNC coaxial connectors supporting direct connection to equipment such as Routers, Video systems or an NTU. 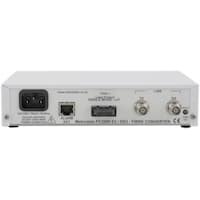 The FC3X00 has integral mains or 40 volt power supply, and can be desktop or rack-mounted. The FC3X00 range can easily be rack mounted in either a 1U two unit rack mount kit , a 6U eighteen unit rack mount kit . The FC3X00 is also available in a card based format for use with the 4U 12-slot MetroCONNECT managed chassis. The FC3X00 is part of a range of range of fibre conversion products from Metrodata. The wider product range offers fibre conversion solutions ranging from 300 baud RS-232, via Nx64kbps rates, through 2Mbps and up to 155Mbps for electrical to fibre conversion; or 155Mbps, 622Mbps or Gigabit Ethernet for fibre mode or wavelength conversion. This application shows a pair of video systems connected over a multimode fibre using a pair of FC3000 units. This multimode fibre could be within a building (e.g. between two video systems at either end of a large hotel), or across a campus (e.g. between two departmental buildings of a University). This application shows a Video system being remotely connected to an NTE over a multimode fibre using a pair of FC3000 units. This multimode fibre could be within a building (e.g. between a video system and a switch room at either ends of a building), or across a campus (e.g. between two departmental buildings of a University). This application shows a pair of E3 routers connected over a singlemode fibre using a pair of FC3100 units. This singlemode fibre could be between buildings (e.g. across a business park), or across a city (e.g. over a rented fibre). This application shows a DS3 router being remotely connected to an NTE over a singlemode fibre using a pair of FC3100 units. This singlemode fibre could be between buildings (e.g. across a business park), or across a city (e.g. over a rented fibre). This application shows a DS3 router being remotely connected to a DS3 G.703 satellite modem over a longhaul singlemode fibre using a pair of FC3200 units. This singlemode fibre could be across a city, or between cities (e.g. over a rented fibre).